Being a content writer/blogger, this is the biggest challenge one faces after some time as the content you are posting should be fresh, should be of your niche and should be in trend. Now, to put all three factors at one place and then generating a fresh new blog out of it could be messy, time consuming and confusing at times. 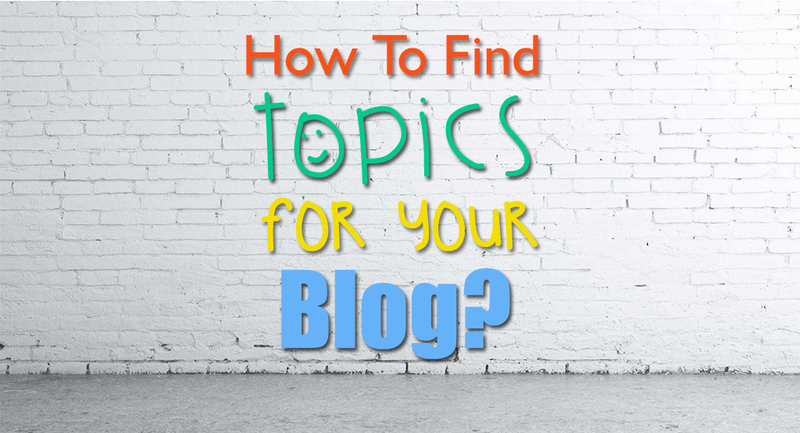 So, now the big question arises, How to find topics for your blog? Thanks to technological advancements, now we have certain online tools to determine the weight of the topic and how much attraction is it going to generate. Content about trending topics is beneficial because you know that what you’re writing about is already popular. There’s likely to be good search volume and it’s something that is top of mind for your target audience. Combination of evergreen content and trending content is likely to be liked by people. When referring to trending content, this isn’t just referring to what is popular today, but also topics and issues that may have been trending over a longer period. So how to find topics for your blog? It’s sometimes difficult to keep up to date with the niche you blog about. Imagine topics such as WordPress, web design and digital marketing; they are tough to keep up with and have many new articles and news pieces per day. Keeping up to date with everything being written would probably take up most of your day. This is where Google Alerts can help to find topics for your blog. You can set up alerts for articles containing keywords that you specify. You’ll then receive emails from Google containing links to new articles they find that are relevant for the keywords you are monitoring. You can set alerts up with several options. I am content with just getting the best results once per day, but you can set up alerts to email you everything as it happens. If the topic you blog about is very popular, you may find getting alerts for everything a little too much. Question and answer sites like Quora can somtimes proves to be a great source to gather idea for your blog post. You can sign up and follow specific topics. You can then set up email updates about the most relevant questions and answers for your interests. Often the questions being asked are great topics for blog posts as you can see what information people want to know more about right now. Obviously, you shouldn’t just copy the answer provided. You should answer the question in your own way and make sure that you add value to the answer. If you want to find out the most popular news for the topics you blog about, Reddit should be one of your go-to resources. Everything here is shared by its members and up-voted if it is popular. It is a great way to filter through the less interesting news, plus the comments can be very insightful. Reddit users can comment on each post and often have quite lengthy discussions. This can help you home in on specifically what your potential readers find most interesting about the news piece. Reddit isn’t just for news, people also use the site to post questions. Similar to Q&A specific sites, these questions and answers can be a great source of blog post ideas since you will know what your target readers want to find out more about. Google Trends is a great tool for viewing search interest for keywords and topics over time. If you haven’t used it before and don’t know what it is, Trends provides search demand data direct from Google. You can view this data by keyword, location, topic and country. You can then decide if interest in the topic you want to write about is increasing, decreasing or has remained stable over time. Not only can you check the trends of keywords you are already aware of, but Trends will provide both the top and rising related topics and queries. You can use these topics and queries as inspiration for blog post ideas that are gaining popularity. The comments sections of posts are a great source for blog post ideas. Often, questions are asked in the comment section when a post didn’t go into enough detail or perhaps, didn’t touch upon a related topic. These readers want to know more and it is this information you can create a post around. The comments you research can either be on your own posts, with you expanding upon something you have already written, or you could get your ideas from the comments sections of other people’s posts. Obviously, if you are looking for trending topics, then you will want to be monitoring the most recent posts. To keep up to date with all the latest articles, consider signing up for your favourite sites’ email newsletters, so you don’t have to manually check for new posts. People often go to forums for advice and many of the questions asked on them are likely to make interesting blog posts. When selecting topics to write about, try and find those that have had quite a lot of engagement as well as being recent. If there are multiple threads about the same issue, it’s likely to be a hot topic and something worth posting about. Some of the tools used here aren’t always going to be able to alert you to the hot topics; the things that everyone is talking about right now. For example, the traditional keyword research tools like Adwords Keyword Planner won’t provide you with the data you need to identify something is trending right now, but rather they will alert you to trends over long time periods. If you’re keen to write pieces about today’s hot topics, then monitoring hashtags will be a useful strategy. If you want to keep it simple, you could go to Twitter, Facebook, Instagram or any hashtag using social network of your choice, and just do a search for a relevant hashtag to the topic you want to write about. Browse what people are sharing and see if there is anything that stands out as a topic you want to write about. You can view the trending hashtags on Twitter, but unfortunately, you can only customise this by location, rather than by topic. If you want to make this process a little more efficient, you’ll need to use some tools. Ritetag can be used for free (there is a premium version) to monitor trending hashtags. You can enter topics and they’ll send you an email to alert if any related hashtags are beginning to trend. You can also use their tool to find out information about specific hashtags, such how many tweets there are per hour, what times of day people tweet the most and which countries are tweeting. Similar to Ritetag, you can also use Hashtagify to monitor hashtags and set up alerts. It’s simply a process of searching for the hashtags that you want clicking on the ‘Activate Email Alerts’ button. When looking for trending blog post ideas, keyword research tools can be a great source of inspiration. You can find out what your potential readers are searching for and tailor your content around that. The Adwords Keyword Planner is still my go-to keyword research tool. It’s free, but you will need to sign up for an Adwords account if you want to use it. Google made some changes to the tool recently; if you aren’t spending enough with Adwords, you won’t get a specific value for search volume. Instead, you will get a search volume range. Whilst this is more ambiguous than a specific value, even the range data is useful for getting an idea of approximate search demand and for comparing terms. The Keyword Planner also provides trends data. You’ll be able to see how search demand has changed for either a keyword or group of keywords over the past 12 months. You can use this to help you identify if a keyword or topic is gaining popularity. Analytics won’t provide as many keywords as it did years ago, due to Google withholding keyword data from organic search traffic. However, you may still find some interesting keywords in your analytics tool from other organic search sources, such as Bing. You can use Google Analytics for free if you aren’t already using another analytics tool. Monitor your analytics to identify the keywords being used to find your site. You may start to notice similar queries popping up time and time again, particularly if those topics are beginning to trend. If you don’t have content that is directly relevant to these search terms, then now might be the time to create that. The keywords people are using to find your website can be a useful source of ideas for content. Google Search Console’s Search Analytics allows you to view the keywords that your website has appeared in search results for and how many clicks those keywords have resulted in. Of course, the more clicks and impressions there are, the higher the demand is for that keyword. You can click on individual queries and view clicks and impressions for those over time. Of course, how well you rank for them will affect these metrics, but you may still be able to spot trending terms. Regardless, if keywords have a high number of impressions, then you know that it is something people want more information on. You may find quite specific queries that can be great to base a blog post around, or they would work well as part of a larger post. Each of these tools and techniques are capable enough to help you when you are stuck with a topic. Although using them together will allow you to dig up the precise information about any topic and how relevant it is to your niche and how trendy it is among the people. You can research about certain topics that revolves around your business category or your customer niche through various tools listed in this blog post and then can come to a conclusion about what to write about in more detailed manner. So, this blog post answers your question of how to find topics for your blog? Apart from this do check out our latest plugin Appointment Scheduler Pro which is designed specifically for the people who struggle with their customer appointments on pen and paper and Pinterest Feed Pro keeping those people in mind who has something of value to display from their pinterest lobby on to their website. Professional blog writing services are a must for business today. Whether you own a small shop or a large enterprise having a blog can be really beneficial for your identity.